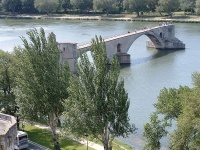 Behind the Petit Palais is the much photographed Pont d'Avignon, also known as the Pont Saint-Bénezet, and fondly immortalised in the famous children's song of the same name. The bridge was originally built in the 12th century to shorten the journey for the busy traders ferrying their goods between the Mediterranean and Lyon. The torrents of the Rhône regularly damaged and brought down sections of the bridge and builders finally gave up repairing it in 1660, four centuries after it was built. Today only four of the original 22 arches remain. On the first of the bridge's bulwarks is the tiny Chapelle St-Nicholas, and this delicate Romanesque chapel, dedicated to St Nicholas, patron saint of bargemen, is well worth a visit. There is a wonderful audio guide available to give visitors the history of the bridge and its cultural significance (and allow them to sing along to a few different versions of the song). Try and avoid the busiest times because the bridge can get a bit crowded and as the attraction's appeal is mainly atmospheric too many people can ruin it. Those who aren't keen to see the lovely little chapel should consider walking up to the park on the hill which overlooks the bridge to simply admire the views. Sitting on the river banks is similarly a very pleasant way to pass the time.